With the growing amount of students work as part of MOM it was decided in St. Joseph’s Secondary school, Drogheda, Ireland that a “MOM wall” would be created. The “MOM wall” is located on a busy corridor of the school outside of the Physics Lab. The wall features student reports and photos from mobilities to Portugal, Germany and Italy, which are created on A0 posters. 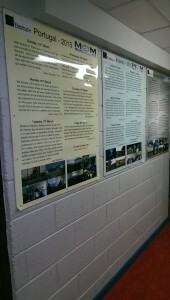 It also features the poster that was presented as the ESERA conference in Dublin. The most recent additions to the wall are A0 posters of the Thermochromic phone case and the Eco Hot Box which are available as didactical materials from the project.